Although I've had tough times I'm not sure I have faced the UNENDURABLE. Sometimes it felt like it! Yet another day of bullying at school. The loss of my hero Grandad when only 13. Spending long nights watching cancer take my mother. Compared to so many small trials but still acutely painful with a strength needed to endure and emerge on the other side. But it would seem that God wants us not only wants us to reach the other side by the skin of our teeth. But he wants to implant in us a strength that far out weighs our own natural strength. 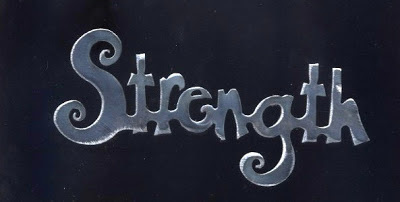 But we can discover "God's GLORY Strength" not as some nice spiritual poster or bumper sticker but as a supernatural reality in our lives. A strength that takes over when our own strength is exhausted. That kicks in when we are just about to give up. That grabs hold when we are about to let go. A strength that is absent within but comes from the above. Is foreign to the human but friends with the divine. It not only lets us endure but plants joy in our heart. Paul prayed that for his fellow believers in Colossae and I still believe it can be found in prayer before our God today.